Maybe you missed it last week with all the excitement of the pictures from Curiosity and its analysis of the rocks on Mars (See my last post: Curious Geology: Stunning Images Reveal a Complex Mars) but there was another pronouncement of further evidence that watery processes were once active on Mars. Where did this evidence come from? It came from a shiny black rock which scientists have closely inspected with many sophisticated instruments and even sliced up and compared to other rocks. Wait a minute you say? How have we examined a Martian rock in such detail! Sure, that rover, Curiosity has some amazing instruments on it but even so all it can do is stoop down and zap a bit of its surface and give it a “smell”. I don’t remember any of these rovers ever sending rocks back to Earth for us to investigate. Ah, that’s right. No rocks have ever been retrieved by man from Mars like they have from the moon. Rather, what geologists have here on Earth are rocks that Mars has sent to Earth. They are Martian meteorites. I’ve heard of meteorites but rocks from Mars have been found on Earth? If I pick up a rock on Earth how would I know that it came from Mars, Earth, the Moon or somewhere else in the solar system? 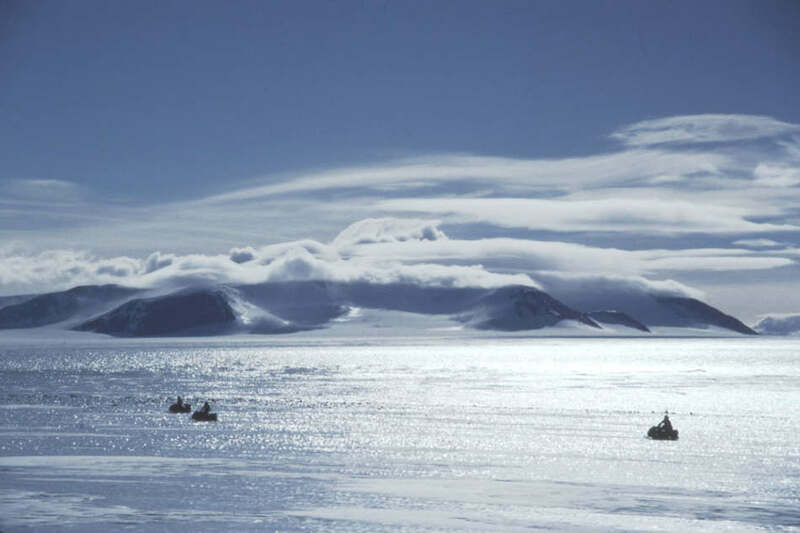 Well, first meteorites aren’t always easy to recognize as alien rocks on earth but some rocks found on barren ice fields in Antarctica or sand dunes in large desert regions can readily be inferred as being of extraterrestrial origin. Some rocks have been witnessed plunging to Earth and picked up. In addition to some meteorites that are confirmed by eyewitness accounts, meteorites usually have elements in abundance that are rare on Earth or have ratios of isotopes or elements that differ from any known formation process on Earth and thus are identified as not of this Earth. 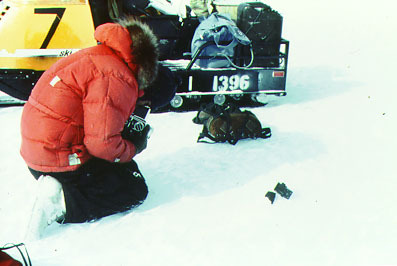 Mars meteorite found in Antarctica in 1984. Since its discovery it has been chopped up into many pieces and distributed to many research labs. But what about meteorites from Mars? Even if we can be confident that a rock is a meteorite how would we know it came from Mars? While the composition of the rocks themselves is a strong indicator of their origin because we have now examined rocks on the surface of Mars for comparison, there is another piece of “smoking gun” evidence for identifying many of the meteorites on Earth as having Martian origins. The story is best told with meteorite ALH84001. 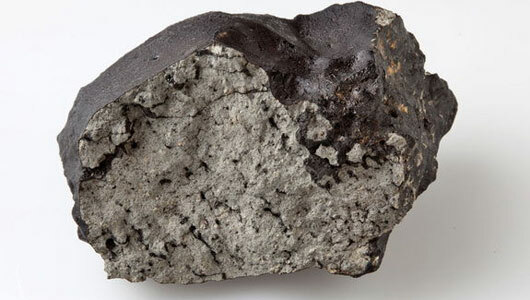 The claim to fame of this meteorite is this is the one that, way back in 1996, some NASA scientists reported provided possible evidence of past life on Mars. 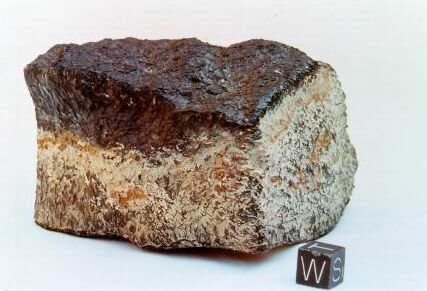 This meteorite was found in Antarctica in 1984 along with many other meteorites. When the meteorite was examined closely it was found to contain trapped in the mineral crystals inside the rock, gases that matched the composition of the atmosphere of Mars as measured by that Voyager Spacecraft lander that took measurements way back in 1976. In this graph we see the abundances of some elements and isotopes in the martian atmosphere compared to the same elements and isotopes in another martian meteorite EETA 79001. Since these numbers fall on the same line it indicates a relationship between the meteorite and the martian atmosphere. Mars has an atmosphere of 95% carbon dioxide, 3% Nitrogen and a bit of Argon, Xenon, Neon and Krypton gases the latter three of which are found on Earth but in much lower concentrations. The fact that gases in these meteorites have similar gasses and ratios of these gasses strongly suggests that these volcanic origin rocks formed on the surface of Mars where they trapped gasses of its atmosphere when the lava solidified or when the rock was melted on impact. That sounds pretty interesting but still quite fantastic. Couldn’t these meteorites just be contaminated with gases from Earth since these meteorites have been sitting on the surface of the earth for possibly thousands of years? There is certainly a potential for contamination but two facts make that very unlikely. First, the tests for the gases trapped in the rocks crystal structure are done by cutting deep into the meteorite while it is in a chamber of neutral gas thus getting to untouched crystals which almost certainly the earth’s atmosphere hasn’t been in contact before. Second, if there was contamination, that contamination would cause the gases to appear more like Earth not like Mars. Our atmosphere is only 0.03% carbon dioxide so it isn’t going to diffuse into a rock and become more concentrated but would rather dilute the CO2 in a Martian rock. The same is true for the other Martian gases. The amazing correlation of the gases in these rocks with the Martian atmosphere gases makes the hypothesis that these rocks are in fact from Mars the best supported hypotheses that anyone has yet proposed. We can see an example of this if we go back to the meteorite that I alluded to in the introduction. That meteorite named Tissint was observed crashing to Earth in Morocco in July of 2011 and pieces of Tissint collected very soon after. Some of those pieces made their way into the hands of museums, private collectors and researchers. 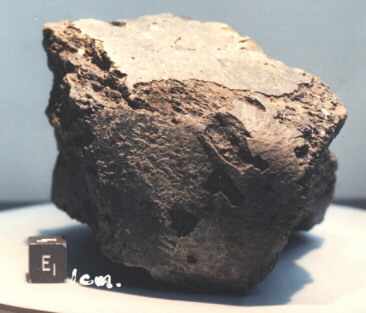 This meteorite was shown to have the molecular composition similar to that of other Mars rocks and the gases also matched those that the Viking lander measured in 1976. This meteorite was seen arriving on Earth so we know for sure it is a meteorite and unlike other Mars rocks that have been found this one was collected very quickly from dry desert so the amount of weathering and contamination it has experienced is very minimal. What is making headlines is the fact that in the cracks in the meteorite are glassy crystals that formed when the asteroid that struck Mars heated the rock on impact and so trapped gases and other molecules from the surface of Mars in the rock. This has given scientists on Earth the opportunity to study a Mars rock, and thus Mars, in great detail. The first thing that have observed is that some of the minerals in Tissint appear to be the result of weathering as a result of the interaction with water and so this has provided additional evidence that surface rocks on Mars used to have much higher water content than they do today. Ok, I get it, these rocks have all the signatures of being just like rocks from Mars and yet here they are on Earth. The data and logic to explain them seems quite reasonable but before I can really believe that pieces of Mars are lying around on Earth I have to ask one big question. How did they get here!!! If there isn’t a mechanism for how they got here than all the evidence in the world for them appearing to be from Mars doesn’t really do a lot of good. That’s exactly the question you should ask, though acceptance of something doesn’t necessarily require that you know the mechanism for how it came to be. As an aside, you accept the fact of gravity without being able to really explain how it works. But in many cases you are correct that having a mechanism goes a long way to making the end results more acceptable. In the 1930s, Alfred Wegner had a lot of great reasons to believe that the continents had moved around over time but he lacked a mechanism for how they moved and so his theories were dismissed for decades. Eventually a number of technologies allowed discoveries that lead to plate tectonic theory which is the mechanism to explain Wegner’s ideas about continental drift. Hmm, maybe this black rock lying on this snow field is a meteorite. But back to our story. Fortunately I do have a hypothesis for how rocks have gotten from Mars to Earth and it doesn’t rely on little green men. It relies on the story that the surface of Mars tells us. A quick look at the surface of Mars reveals thousands of craters. The largest craters have been shown to be the result of massive impacts that were so large that material from Mars would have been ejected into space from the surface. When I say “shown” above, I mean that geophysicists, knowing something about the gravity, density of the atmosphere and the rocks composition can calculate the size of impact needed to create ejection speeds fast enough to escape the gravity of Mars. Remember that Mars is much smaller than earth and so the escape velocity is much lower than it is for Earth. Using those numbers there are multiple craters on Mars that fit the criteria and thus likely ejected hundreds of millions of pieces of Mars into space. That process of impact and ejection would itself alter the rocks (melting, fusing and trapping gases) and we can see those alterations in the meteorites from Mars on Earth which also distinguish them from other Meteorites which have never been part of a planet before. So here are the steps: 1) Large asteroid/meteor strikes Mars and ejects millions of pieces of Mars into space. 2) Some of those pieces may end up in orbit around Mars for some time with some falling back and causing some of the smaller craters seen on Mars today but many of the pieces simply drifting off into space at speeds and directions determined by their expulsion rates and vectors. 3) Some of those pieces end up drifting toward the Sun because it’s gravitational pull. 4) At some point some of those pieces find themselves intersecting with Earth’s orbit and crash through its atmosphere and some of them make it to the surface to be picked up by an eager meteorite hunter. Isn’t Mars is a long way away? How long would it take to get to Earth? Mars is a long way away! The average distance from Earth to Mars is 156 million miles but it can be closer. The rocket carrying the Curiosity Rover to Mars made the trip in just 254 days travelling at speeds of 500,000 miles per day or 21,000 miles per hour. Of course those speeds were assisted by rocket thrusters after leaving Earth’s orbit. Meteors from Mars aren’t expected to make the trip nearly that fast but rather are thought to slowly drift in space for hundreds of thousands if not millions of years before intersecting with the Earth. This still sounds a bit fanciful to me. How do we know meteorites took that long to get here and how could so many rocks from Mars run into this tiny blue ball 150,000,000 miles away? The transit time isn’t just a guess but can be crudely calculated by something called cosmic ray exposure age. The idea is that when rock, like one exploded off the surface of Mars, is exposed to outer space it will be bombarded by cosmic rays from the Sun and the rest of the galaxy. These rays produce new isotopes in the surface layers of the meteorite. The longer that the meteorite is exposed the more of these chemical isotopes will build up. When the rock finally lands on earth it no longer be affected the same way and those isotopes won’t continue to build up. So this is a form of radiometric aging in that the amount of isotopes are measured and given an average cosmic ray exposure the time of exposure can be calculated. The dates are rather crude but still give a sense for age ranges. Most of the Mars meteorites have exposure times estimated in the tens of millions of years. 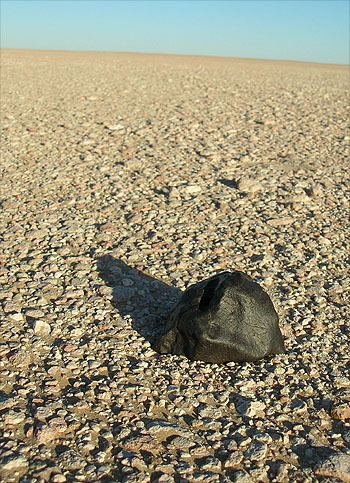 This most recent Mars meteorite that fell to earth in July of 2011 had a “low” exposure estimate of 700,000 years give or take a couple hundred thousand years. So you are saying that these Mars rocks have taken possibly millions of years to travel between the planets. But I believe the Earth is only 6000 years old. Can I still believe that these rocks actually were on the surface of the Mars in the past? I can’t say that the evidence can provide much comfort at this point. If this Tissint meteorite had only been in transit for 4000 years one would expect to find barely any discernible cosmic induced isotopes and yet there are plenty in this Meteorite. These isotopes are barely formed on Earth nor would the rock on Mars be expected to have accumulated these isotopes either. My calculations suggest that for a rock to have traveled from Mars to Earth (127 million miles on a short trip) in 4000 years it would have had to travel at a minimum of 1300 miles per hour. Not only do we not see craters on Mars with the appearance of being that young but even if there were it would seem very unlikely that many rocks would escape Mars gravitational field with that much inertia left to make the trip that fast. However, millions of rocks thrown off Mars at much slower velocities would gradually drift toward earth orbit over time. I’ve read somewhere (I can’t find the reference at the moment) that calculations have been made that suggest that given millions of years and the number of craters formed by impact forces strong enough to throw rocks of Mars it is expected that some of these rocks should make their way to Earth’s surface. To date there are 99 such rocks that have so far been identified and that only represents the rocks that have landed and remained on surfaces that have allowed their identification. Surely there must be 10s of thousands of Mars rocks on Earth. For that many rocks to have made their way from the surface of Mars to the Earth in less than 6000 years I suppose is statistically possible but ridiculously unlikely. I’ve searched for a young earth creation explanation for Mars meteorites on earth and found almost no mention of the origin of these rocks. The focus is all on the ALH84001 and debunking the proposed evidence of past life claimed to be contained it. In those discussions the rock is only referred to as “presumably” from Mars as if to cast suspicion on its origins and thereby cast suspicion on the claims of life. The only creation scientists that I have found that has taken on the Martian origin of the rocks head on is Dr. Walter Brown who I have talked about in the past (Walter Brown and the Origins of Asteroids and Impact Craters on other Planets). Remember that Brown believes that all the craters on Mars and the Moon are the result of material thrown off Earth during the first stages of the global flood 4000 years ago. That material, according to his flood geology theory, traveled through space impacting Mars and the Moon and so contributed to a flood on Mars just after flood on Earth since so mach water was brought by these rocks and icy asteroids. Brown then casts doubt on the Martian origin of these rocks on Earth. He claims that the gases in the “Mars” rocks on earth are the result of gases that were found in the inner earth and expelled into space which why Mars has those gases today. Yes, he is saying that the compositions of the Mars atmosphere is in large part the result of gases transported to Mars. The rocks we find today on Earth that look like Mars rocks are really from the pre-flood world that may have gone into Earth orbit and dropped back to Earth very recently. Meteorites Created with Apparent Age? If there are meteorites from Mars on Earth then have we also identified meteorites from other solar system bodies? The only other member of the solar system for which we know that we have meteorites on Earth is the Moon. There are hundreds that have been identified on earth though they are not nearly as numerous as meteorites of unknown origin. You might think that there would be many more moon meteorites but since the moon is so close to us rocks knocked off the Moon don’t take too long to end up on Earth or leave our orbit. H. Chennaoui Aoudjehane et al. Tissint Martian Meteorite: A Fresh Look at the Interior, Surface, and Atmosphere of Mars. Science. Published online October 11, 2012. doi: 10.1126/science.1224514. What angle of impact is needed in order for part of the ejecta blanket to be thrown sufficiently high and with an escape velocity? I understand this is more of a physics question, but I was wondering if you had ran across the answer. Hi, good question. It might not sound intuitive but I believe a strike straight down is best. It is the rebound like a drop of water into a pool that is what ejects material into space rather than the splatter from the edges. Here is an abstract to one of many papers that have done calculations on craters on Mars. http://www.sciencemag.org/content/298/5599/1752.abstract Here they report that even craters as small as 3km in diameter could have resulted in material bounced back as speeds that would reach escape velocity. If this is the case then there are hundreds upon hundreds of impact craters that could have contributed to Mars rocks in space. Martian gravity is less than 40% that on Earth at sea level which makes a huge difference. There are only a few craters on earth that suggest an impact large possilby large enough to eject material into space so it isn’t expected that Earth rocks would be found on Mars. My next post will probably be about meteorites found on the surface of Mars but none of these are from Earth but are from farther out in the solar system. I’ll read your blog properly tomorrow when I’m less tired. “As the Curiosity rover ventures into previously unexplored territory on the surface of Mars and attempts to pick up and analyse rock samples for the first time, many hope that the NASA robot might find signs of life on the red planet. But, after so many false dawns and with such ambiguous evidence, how can we know for certain whether or not there was ever life on Mars? Jim al-Khalili and Monica Grady, Professor in Planetary Sciences at the Open University, discuss what life on Mars might look like; Monica’s passion for meteorites and the asteroid named “monicagrady” in her honour”. Perhaps Mr Issac Bourne should read your articles. As mentioned, he censored my attempted comment here (BEFORE EVEN READING IT, ASSUMING HE EVER DID). Ashley, Yeah, I can get it. Good stuff. I have a piece of a rather famous meteorite myself but I’ll save that story for the next post when I talk about meteorites that are found on Mars. Yep, these rovers have been good at finding non-Mars rocks on Mars! Dated as leaving Mars 700,000 years’ ago. I gather you are saying some rocks on Mars might in turn be meteorites from elsewhere – an intriguing thought.